What do you call a fly with no wings? If you are someone’s Dad you are probably compelled to answer “a walk”, but, in fact, there are hundreds of species of fly that have given up on flight. What do you call a fly with no wings? Well, it could be a female phoird, or a hippoboscid, or perhaps a Mystacinobia. So here’s a brief survey of a few flies that have taken a brave stand against nominative determinism and given up on flight. You might be wondering how you can given the name “fly” to a flightless creature. Taxonomic groups reflect the evolutionary history of life. So for instance the great ape family contains orangutans, gorillas, humans and chimps because all these species descend from a shared common ancestor. When entomologists talk about “flies” they are referring to the taxonomic order Diptera – a group of insects that share a common ancestor that lived approximately 250 million years ago. Of course, organisms don’t come with little tags telling us where they came from, it’s the job of taxonomists to find characters that can be used to reconstruct that evolutionary history. The character that most sets flies apart from other branches of the insect tree of life is the presence of “halteres” – the stubby yellow structures this predatory robber fly is modelling (more on that fly here). Diptera means “two winged” and the name refers to the fact that most flies get about with one pair of wings, having reduced their second set into the flight-satablising halteres. This little innovation has allowed dipterans to become precision fliers, and one of the most successfully groups of organisms on earth with about 150 000 species (maybe 10% of all species are flies). The true flies in order Diptera all descend from an ancestor which flew with two wings, but many of the species that descend from that ancestor have given up their wings. Because taxonomic groups are reflections of evolutionary history even wingless species are still flies – you can call them the apterous members of Diptera (wingless two-winged insects). Flies in the family Hippoboscidae are blood suckers. Many of these parasites fly from hosts to host, but a number of species have become so intimately associated that they’ve given up on flying – moving from one animal to another only while those hosts are in physical contact. The flightless hippboscids are generally called “louse flies” or “keds” and the most well known examples include species that specialise in drinking from pigeons, cattle and sheep. The “sheep ked” was once considered a pretty serious pest in New Zealand, but evidently it has been controlled thanks to “dip” and “pour on” insecticides that lambs are treated with. Besides the direct impacts, hippoboscids are potentiral vectors for blood borne disease, they have been implicated in the spread of avian malaria and are suspected for spreading other dieases. The bat flies have lost their eyes as well as their wings, by have made up for those loses in other body parts. 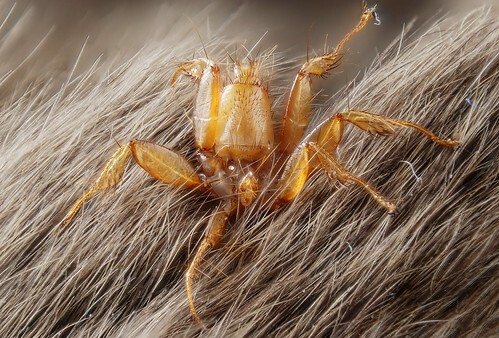 The massive spider-like legs end in tiny claws that let the flies grip on the bat’s fur and move about. Once stuck on a bat these flies drink blood. The fauna of New Zealand is very keen of flightlessness. Charasmatic mega-fauna like moa, kiwi and kakapo are the obvious examples, but we are also one of only two places on earth to have flightless perching birds (our three wrens are now extinct, as is the Canary Island Bunting). There are no truly flightless bats, but our short tailed bat is probably the closest thing – spending most of its time crawling around the forest floor. Our terrestrial bat hosts its own flightless flies. 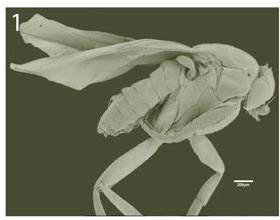 Apparenlty Mystacinobia zelandica descends from a blowfly but its association with the short talied bat has changed its body so greatly that is was not originally considered to be a fly at all, and thought to represent a unique order of insects. I couldn’t find any photos of Mystacinobia avaliable with a permissive license, but check out the New Zealand Geographic story and Te Ara’s article, which even has a video. Mystacinobia has been placed in a family that is endemic to New Zealand, but there is one fly family with an even more restricted range. 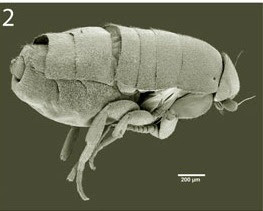 As far as we know, the family Mormotomyiidae is represented by a single species (Mormotomyia hirsuta) which is only known from a particular site in on one mountain in Kenya. As you may have guessed the site is a bat roost, and the animal, despite being only distantly related to the other bat flies discussed above, has taken on the spidery form that is associated with flies that spend their lives with bats. Mormotomyia doesn’t have the hooks that other species use to cling on to bats, so it may be a little more free-living than than the species discussed above. 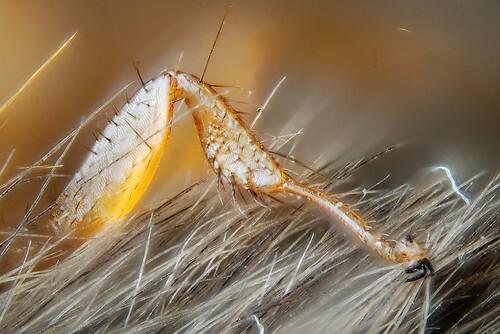 The family Phoridae might be the strangest group of flies . Hell, one genus is made up entirely of flies that burrow into the heads of ants, decapitate them, and use the severed head as a cocoon. 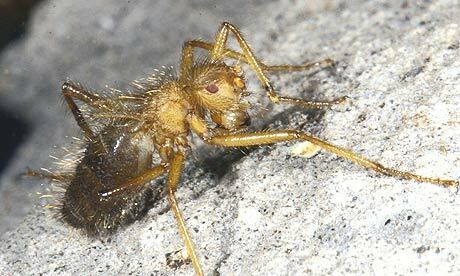 A.lubbockii is a parasitoid of ants, the females live within an ant nest and lay eggs in the ants pupae. It is though that the rounded body, with relatively few jointed segments for ants to hang on to, helps them move around within a nest. But, of course, for that to work females need to be able to move on from the nest in which they are born. That’s where the winged male comes in, A. lubbockii males airlift their females into ant nests. The males pick up females and carry them, mating on the wing, before dropping them off to infiltrate a new nest. I’ve heard some interesting critiques of evolutionary theory, but a lineage not evolving in the way a particular person would in the same situation might be the strangest. Even comical misunderstandings of evolution give us an insight into more common ones, and I’m sure this commenter’s confusion arises from a widespread “cartoon” version of evolutionary biology, in which changes within lineages is always progressive and moving towards more and more complexity. The “walks” discussed above, and the many more that I skipped over, are a good reminder that the only metric in evolution is “what works”. 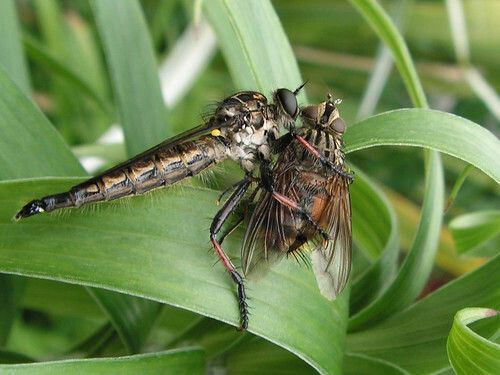 When these species took up lifestyles that don’t require wings they soon lost them – either because maintaining wings and the muscles required to drive them was a cost they could profitably avoid, or because the “stabilising selection” that protects useful features from the ravages of mutation was no longer present. Seeing as you referred to flightless phorids, I feel compelled to link to this. Awesome! While I find all flies fascinating, those that have lost the need for wings are especially interesting. The huge diversity of ecological niches they fill means we will always have something interesting to discover. Exciting! Phorids are certainly one of the most bizarre fly families, with many, many different wingless species. One of the world’s leading phorid experts, Brian Brown, has recently started blogging, showing off some of the ridiculous looking flies he’s come across in his travels and samples. Well worth a look! “Evolution is flawed”. But nothing’s wrong with his/her education, obviously.